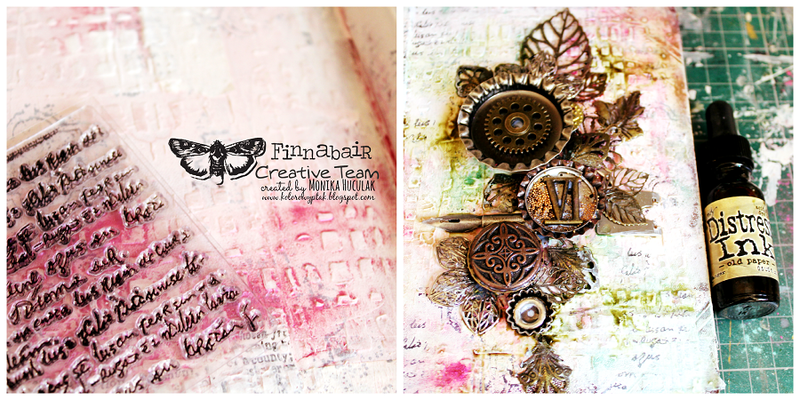 Today we have Monika who created a breathtaking cover for her new art journal. Book Art at its best!! And speaking of my Team - I hope you haven't missed this amazing post they prepared sharing their thoughts and inspirations about their favorite products. The girls did such a brilliant job! 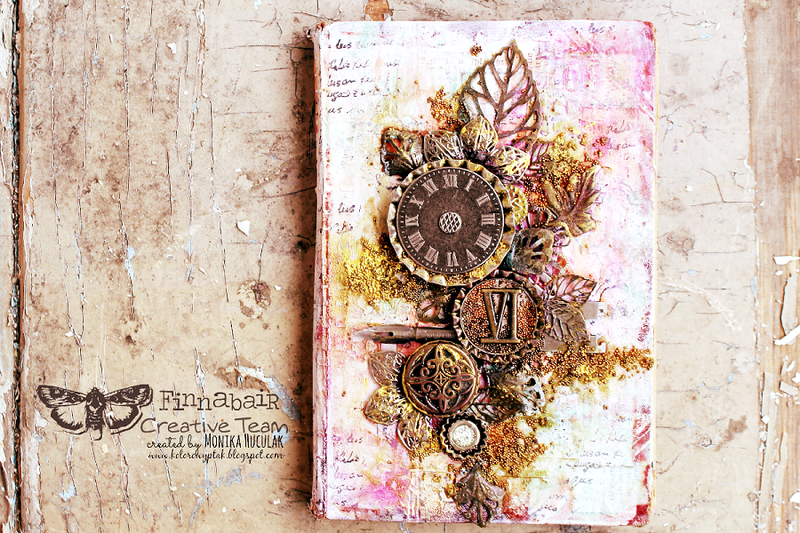 Today, I'd like to show you a cover of my art journal with lots of textures, embelishments and colors. I had so much fun creating it! 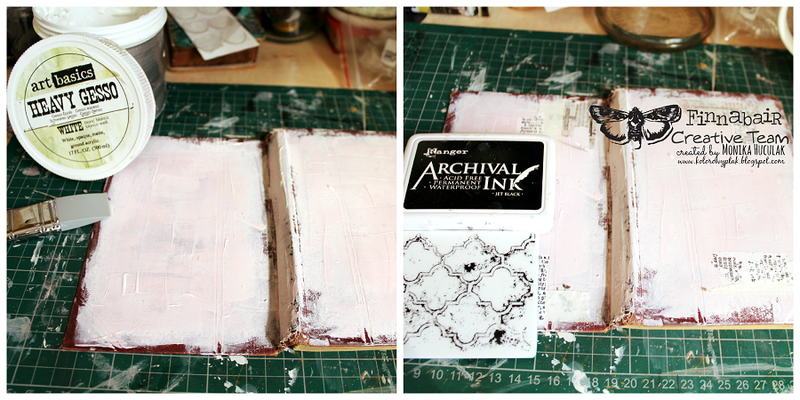 My new art journal is a vintage book that I bought a while ago. It was waiting for two months before I decided to finally alter it. I added some paper tapes and a new stamp from the Old Town set. My next layer was Opaque Matte Modeling Paste and Weaving stencil. After drying, I added all the metal elements (including Mechanicals) some of which I cut into pieces (for example the flowers). Once again, the best product to glue all these trinkets turned out to be Soft Gloss Gel. Then I reached for Micro Beads (Bronze & Copper) - first, I was applying them rather carefully but later on, when I got the feel of them - I was more brave to use these beautiful tiny elements. 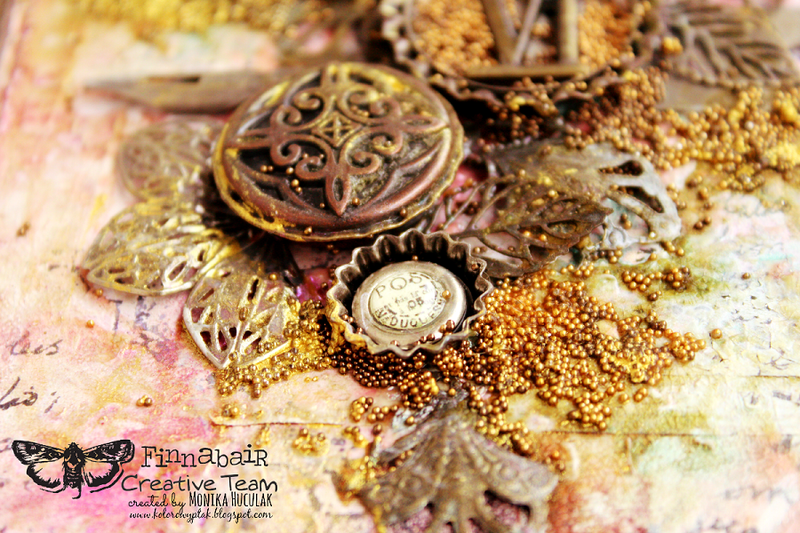 As for the color, I used one of my favorites among Finnabair's latest release - Mica Powders in Pink and Teal. 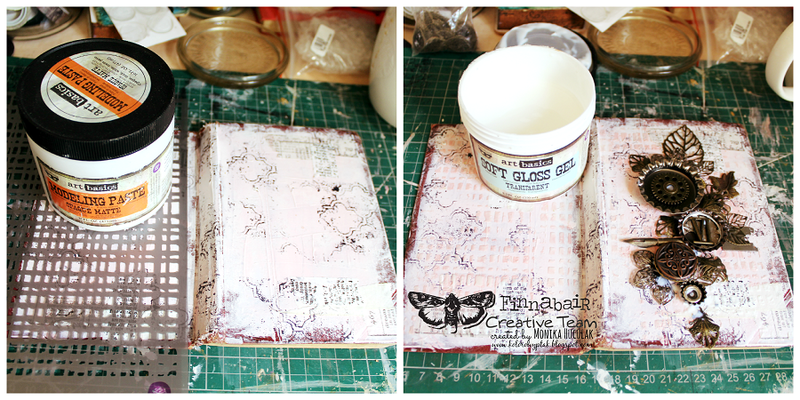 I added some freehand stamping with Messy stamp and a couple of drops of Old Paper Distress Ink. 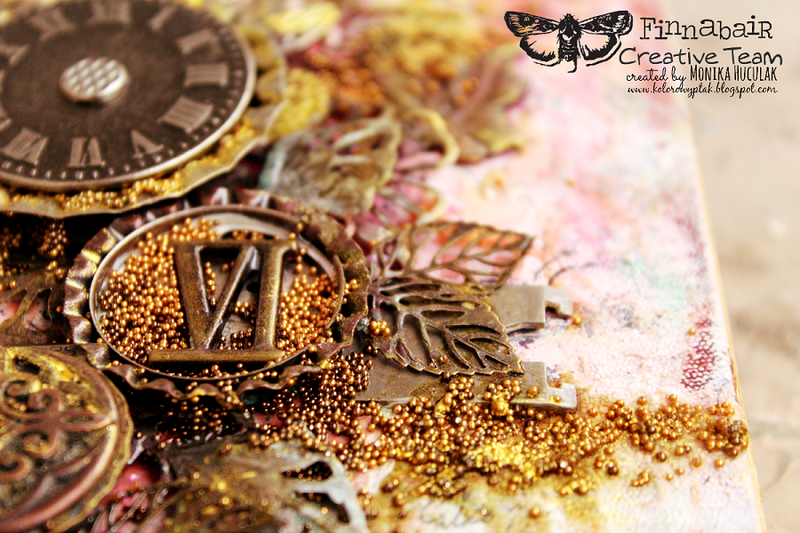 I decided to place a clock face on one of the caps and added even more Micro Beads and some gold Silks paint. Finally, a layer of Clear Crackle Paste (I can't stop myself from using it...) and I left the whole piece to dry. 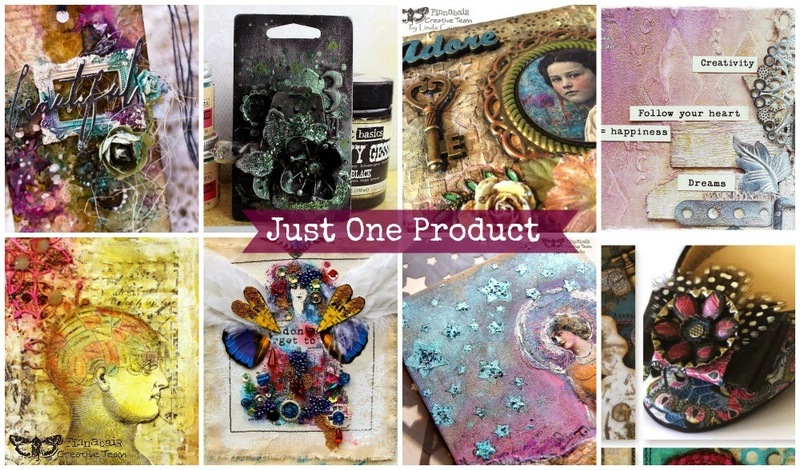 I hope I inspired you to create your own art journal covers. 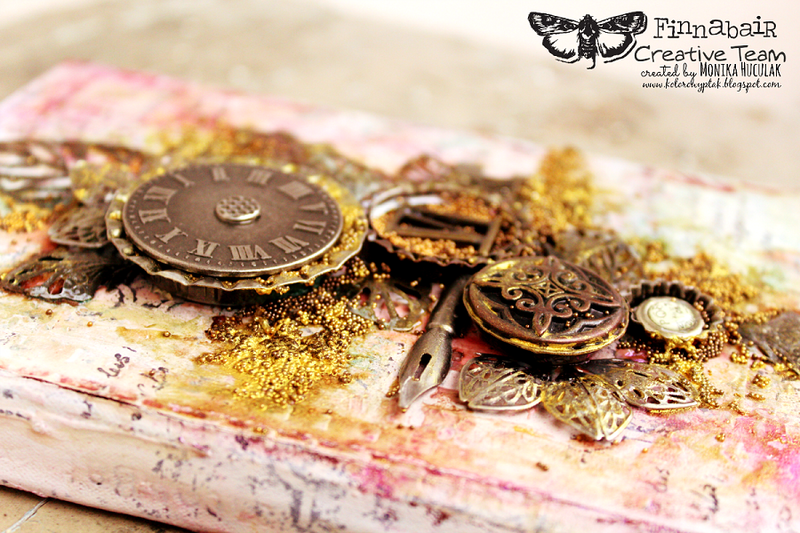 A beautiful journal cover. I love the addition of those microbeads. Awesome!!!! Love this! I have the perfect cover to use! Oh how delicious those microbeads look...I´m afraid I can´t withstand those beauties any longer. Thanks so much for this great inspiration. 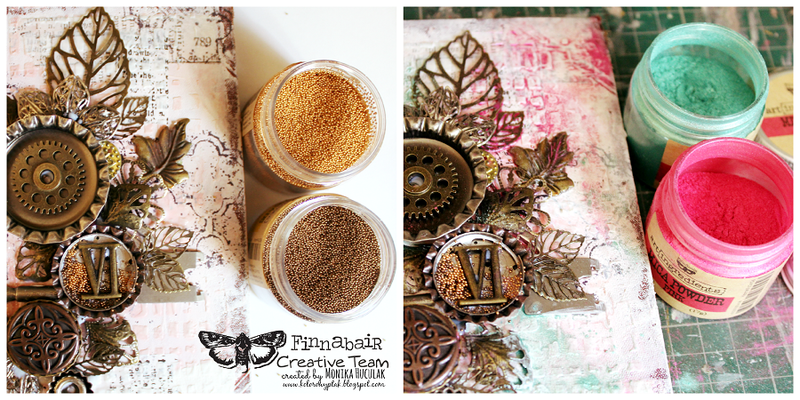 Your journal cover is really beautiful - and the mechanicals, beads and micas are all perfect. Wow - this is stunning. I love how this turned out. Wonderful cover, it turned out beautiful. 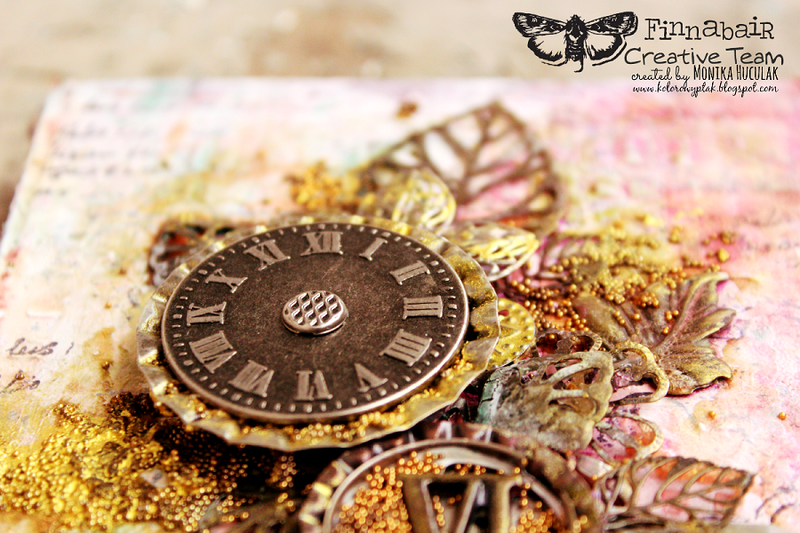 I tried micro beads on a collage recently. I bought a ton of colors on clearance. What medium did you use to affix yours? I had roly poly issues. Thanks in advance! Love love love your altered cover! Ladies, I want you to know how much I appreciate your kind words! Gina, I used Soft Gloss Gel :) but sometimes I use Soft Matte Gel too. Keep makin' beautiful stuff, you inspire me. I love this cover!!! Thanks for sharing. This is just so damned yummy!